In what has become affectionately known as the “Backyard Brawl” around Berks County, the Saints welcomed rival Wyomissing to LLoyd Wolf Gymnasium Thursday evening. Both the Saints and Spartans had already clinched their respective divisions heading into Thursday’s contest. The Saints jumped out to a 7-0 lead early in the first quarter behind three-point field goals by Pop Lacey and Connor Jack. However, the Spartans would answer with a three-pointer of their own as Brock Kovach knocked one down from what seemed like NBA range. After the Spartans pulled within two at 7-5, the Saints turned to their big man and model of consistency, Nana Foulland. When the quarter came to a close, the Saints had upped their lead to six, 18-12. The Saints would start off the second quarter much like the first, with a three-point field goal by Pop Lacey. After pushing their lead to 11 the Saints forced Wyomissing to burn a timeout trailing 24-13. The Saints, who had a noticeable size advantage went to work in the paint and pushed their lead to 18 by the time the first half concluded, 40-22. Both Nana Foulland and Connor Jack were essential to the Saints success down low. After allowing the Spartans to pull within 16 with under four minutes left to play in the third quarter, the Saints offense exploded from beyond the arc. Both Pop Lacey and Isaac Lutz connected on long range jumpers, putting the Saints up 53-31 with about a minute left in the third. The Spartans would score the final bucket of the third, cutting the lead to 53-33. Both teams essentially emptied their benches in the fourth quarter, as the Spartans conceded the game to the Saints. The Saints claimed a 68-43 victory when it was all said and done. 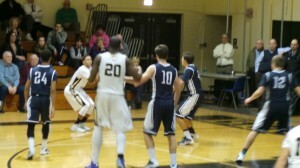 Berks Catholic was led by senior Nana Foulland, who finished with a game-high 24 points and 19 rebounds. Juniors Connor Jack and Pop Lacey added 17 points and 13 points, respectively. The Spartans were led by Brock Kovach, who finished with 15 points. The Saints and Spartans will be awaiting the final power rankings Friday to find out which plays Daniel Boone and which plays Exeter.